This globally sourced and thoughtfully grouped trio of stones inspires confident persistence. Let this set of three naturally beautiful stones serve as a reminder that success is a matter of confident persistence. 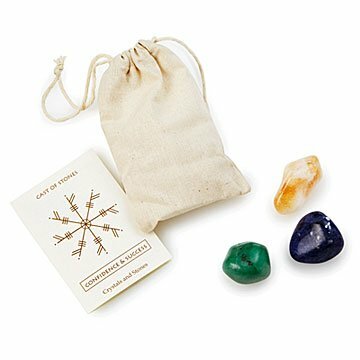 The stones are grouped from around the world and paired to emphasize strength: Green Aventurine is known as the stone of opportunity, thought to promote prosperity; Sodalite is said to inspire self esteem and honest communication; Citrine is associated with abundance and achieving your goals. The trio is accompanied by an affirmation card with the message, "I will persist until I succeed." Carry them in their cotton drawstring bag to inspire everyday success, or add them to your decor for an earth-centered touch. Packaged in Los Angeles.